Tuttnauers are our best-selling sterilizers — and for several reasons. Tuttnauer sterilizers were originally made to handle laboratory work environments, and they just seem built sturdier than the competing sterilizers. For this reason, Tuttnauer automatic models also enjoy the longest warranties available in the industry, double the warranty offered by Ritter and Pelton & Crane: an unmatched 24-month parts and labor warranty. Our technicians (certified on all of the main sterilizer models) have also pointed out the reduced maintenance costs for Tuttnauer sterilizers, and how something like the not-uncommon repair they run into on Ritter M9's and M11's after a few years (where the steam, obviously traveling upward, damages the control panel they positioned directly above the door) is completely unheard of on the Tuttnauer automatics, which have their control panels located safely to the right, away from the direction the door even opens. And finally, Tuttnauer especially stands out as boasting the extremely convenient (and extremely beneficial) HEPA air-filtered closed-door drying cycle (available in the EZ9, EZ10, EZ10K, Elara 11, and 3870EA automatic models), which enables you to elect to have your instruments finish up completely dry, in a closed, sterile chamber, unexposed to outside air — very helpful if you just want to set it and forget it. We would be happy to consult with you over the phone to help you determine the best possible sterilizer for your specific needs and work flow. Call us today at 800-839-0722, or send us an inquiry. Best Fit: Our best small-chambered system, perfect for getting a small number of instruments in and out quickly. It has three trays, each 4.7" x 11.6", and an average cycle time of 9 to 12 minutes. And now it even boasts a closed-door drying cycle! Best Fit: The automatic EZ9 and EZ10 are perfect for average-sized medical, dental, and veterinary practices, and equally popular in hospital and university labs. The closed-door drying feature is especially popular, and you have the option of a built-in printer for recording cycle data. With the 9" model you have three trays, with the 10" four trays, and these are sized 6.7" x 16.3". The average cycle time is 20 to 30 minutes (and then a variable drying cycle). The new EZ-Plus autoclaves are the biggest and most advanced mid-sized options available. New features inclue an easy to close door, a front water loading port, simple controls, and three ways to access your cycle information. Both models still have the HEPA-filted closed-door drying and the 2-year warranty through Tuttnauer. With the 9" model you have three trays, with the 11" five trays, and these are sized 6.7" x 16.3". The average cycle time is 20 to 30 minutes (and then a variable drying cycle). Best Fit: Excellent for average-sized medical, dental, and veterinary offices, without all of the bells and whistles. You will need to manually vent the system to let out the steam, but if you don't need anything programmable, these are the most durable and dependable sterilizers available. With the 9" model you have three trays, with the 10" four trays, and these are sized 6.7" x 16.3". The average cycle time is 20 to 30 minutes. Best Fit: If speed is important, and rapid turn-over, these models will give you a 9-12 minute average cycle, even with the larger 10" chamber size and four 6.7" x 16.3" trays. The actual electrical hook-up, while 220V, is easy enough for an electrician to set up for you -- and worth the extra step if getting your instruments through quickly is critical to your workflow. Your other option here is whether to go with the manual 2540MK or the automatic EZ10K. Both have the same chamber dimensions, the same trays, the same cycle times. But with the automatic EZ10K, you also have programmability, and more importantly, closed-door drying. So where with the 2540MK, you need to open the door yourself at the end of the cycle and let the last of the steam out and remove the instruments to dry ... with the Tuttnauer EZ10K, you have the very convenient option of allowing the system to run its closed-door HEPA air-filtered drying cycle — so your instruments remain in a closed, sterile chamber, dry, until you are ready to remove them. Best Fit: If you are needing to sterilize porous or lumened instruments and require a pre-vacuum cycle, while wishing to keep your autoclave affordable, small enough to fit on a counter or tabletop, and simple and easy to set up and operate (without external plumbing or any complicated installations) — then the new Tuttnauer Elara 11 is the one for you. Best Fit: If you need a large-chambered autoclave, this is as large as you can go before stepping into the very expensive hospital/industrial category. With a 15" chamber and two trays (one 11.3" x 26.6", the other 13.8" x 26.6"), capacity for 15 full-sized cassettes, and an average cycle time of about 45 minutes, the Tuttnauer 3870 is the biggest system we carry. It comes with an optional stand, enabling you to free up counterspace if you like. The manual version is a conventional sterilizer, whereas the automatic model is programmable, has closed-door drying, and can come with a built-in printer for recording cycle data. This is one of our best-sellers for large offices or surgery suites, as well as for hospitals and universities. Tuttnauer manual sterilizers (2340M, 2540M, 2540MK, Elara 11, 3870M). 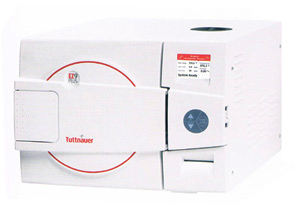 Tuttnauer automatic autoclaves (EZ9, EZ10, EZ10K, EZ9-Plus, EZ11-Plus 3870EA, 3870EAP). All Tuttnauer sterilizers and autoclaves come with a 10-year Chamber Warranty. Within the United States: Free!